Chocolate made with Love and Prayers – and by the Environmentally Conscious! Trappistine Quality Candy is run by a Cistercian (Trappistine) order of sisters, who dedicate their lives to prayer and labor, supporting themselves by the work of their hands, and living a life of simplicity, frugality, and good steward ship. 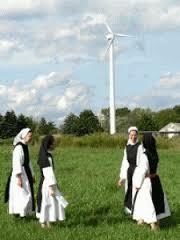 And the sisters have followed their rule faithfully, implementing three green energy projects on their property: Wind, Solar, and Geothermal Energy systems. 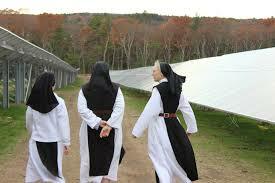 Mount St. Mary’s Abbey was recognized by MassEnergy, at their October 2013 annual meeting, receiving a Leadership Award for having hosted not one, but three sustainable energy projects on their property. Mass Energy is a non-profit organization dedicated to promoting the advancement of sustainable energy projects in the state. Most recently, the sisters agreed to host a solar array on their property, which will supply power to 80% of the Town of Franklin’s public buildings. “Mount St. Mary’s Abbey is the first location in the state and one of the few in the country that hosts three forms of renewable energy on the single property: A geothermal system that reduces costs of heating/cooling their chocolate factory; a wind turbine that powers the abbey itself; and now the solar array, which benefits the Town of Franklin while helping the sisters to continue to be a self-supporting community, “ adds Andrew Bernstein, Managing Partner of Kearsarge Energy, who managed implementation of the project.